Training is an organized activity conducted to improve the performance of an employee and to bring about a considerable change in the skills, knowledge, attitude, behavior for performing a particular kind of a job. There are several types of training programs which are carried out in the different business situations. Induction or Orientation Training: Introducing a new employee to the organization’s environment comprising of a day to day functioning, products, services, rules and regulations are termed as Induction or orientation training. The purpose of such training is to reduce the nervousness of a new joinee, by making him accustom to the working environment.It is also called as an orientation training, which means giving a fair idea to the new employee about, what he is supposed to do in the organization. 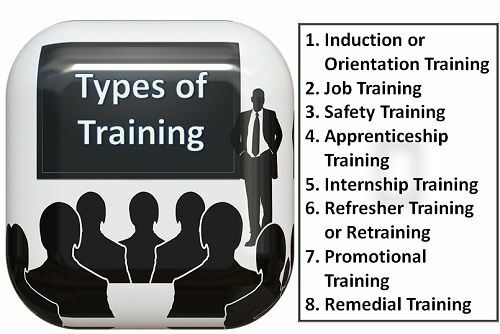 Job Training: This training is job specific and is given to the employee who has to perform that job. Under this training, the information about the machine, the process of production, methods to be used, the safety measures to be undertaken, etc. are explained.Through this training, the employee develops the confidence and the necessary skills, that enables him to perform his job effectively and efficiently. Safety Training: The safety training is given to the employees so as to minimize the number of accidents caused due to the handling of machines or other equipment. Under this training, the employees are given the safety instructions on the usage of machinery and the other dangerous devices. Apprenticeship Training: Under this training, the worker earns while learning. This training is generally given to the technical staff, craftsmen, plumber, etc. who are required to work under the superior for a relatively longer period, until he gains the expertise in that particular field. Internship Training: Under this type, the educational or vocational institutes have an arrangement with the industrial institutes to provide practical knowledge to its students.Sometimes, the companies also offer the pre-placement offers to the trainees on the basis of their performance during their internship program. Refresher Training or Retraining: As the name implies, the retraining or refresher training is given to the old employees with the purpose of improving their efficiencies. They are introduced to the new methods and technologies that would result in the increased productivity and reduces the monotony in their daily work. Promotional Training: This training is given to the potential employees, who can be promoted to the senior position in the organization. The promotional training is given in advance so that employee gets accustomed to the new roles and responsibilities and do not get nervous at the time of promotion. Remedial Training: This training is given in order to overcome the shortcomings in the behavior and performance of old employees. Due to the invention of technology, the employees may resist to accept the change and cause a disturbance in the organization.Therefore, such training is given to make them understand the importance of change and its necessity in the operations of business. This training is generally given by the psychological expert. Thus, different kinds of training are imparted to the employees depending on their job position and the skills required to perform a particular kind of a task. Thank you Soo much… It’s really useful for my examination..